Focusing on an important class of compounds in organic synthesis, this text features contributions by leading experts, and delivers the quality expected from the Patai Series. 1. 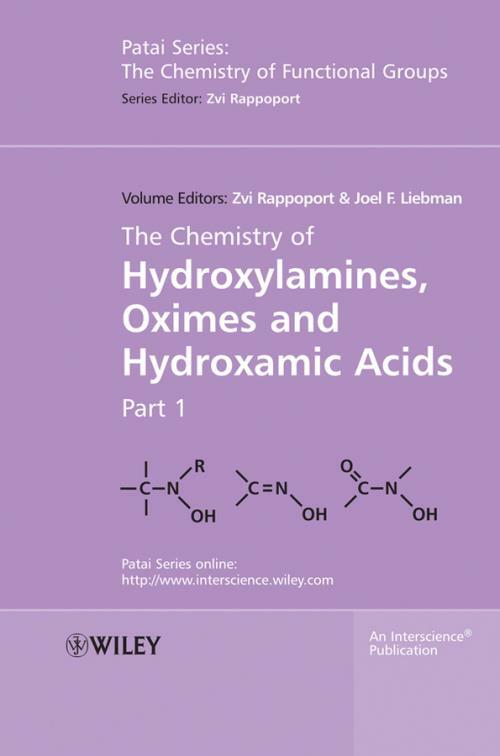 Some intrinsic features of hydroxylamines, oximes and hydroxamic acids: Integration of theory and experiment(Peter Politzer and Jane S. Murray). 2. Structural analysis of hydroxylamines, oximes and hydroxamic acids: Trends and patterns (Peter Politzer and Jane S. Murray). 3. The organic thermochemistry of hydroxylamines, oximes, hydroxamic acids and their derivatives (Suzanne W. Slayden and Joel F. Liebman). 4. NMR spectra of hydroxylamines, oximes and hydroxamic acids (Peter Rudolf Seidl and Jacques Fernandes Dias). 5. Synthesis of hydroxylamines (Artem Melman). 6. Synthesis of oximes and hydroxamic acids (Andrea Porcheddu and Giampaolo Giacomelli). 7. Synthesis of heterocycles from oximes (Edgars Abele and Edmunds Lukevics). 8. Electrophilic C–amination with O–substituted hydroxylamines, oximes and O–substituted oximes (Ender Erdik). 9. Rearrangements of hydroxylamines, oximes and hydroxamic acids (M. Manuela A. Pereira and Pedro Paulo Santos). 10. Electrochemistry of hydroxylamines, oximes and hydroxamic acids (Osamu Onomura). 11. Use of oximes, hydroxamic acids and related species as reagents in inorganic analytical chemistry (Maja Ponikvar and Joel F. Liebman). 12. Structural effects on reactivity and properties of oximes and hydroxamic acids (Marvin Charton). 13. Hydroxylamines and oximes: Biological properties and potential uses as therapeutic agents (Yacov Ashani and Israel Silman). 14. Nitrosomethanides and their acids: Synthesis, structure and bonding (Axel Schulz, Harald Brand and Alexander Villinger). 15. Nitroxyl radicals (Carlo Galli). 16. Natural and biomimetic hydroxamic acid based siderophores (Abraham Shanzer, Clifford E. Felder and Yaniv Barda). 17. Hydroxylamine, oximate and hydroxamate as –nucleophiles in dephosphorylation (Erwin Buncel, Ik Hwan Um and Fran¸cois Terrier). 18. N–Heteroatom–substituted hydroxamicesters (Stephen A. Glover).